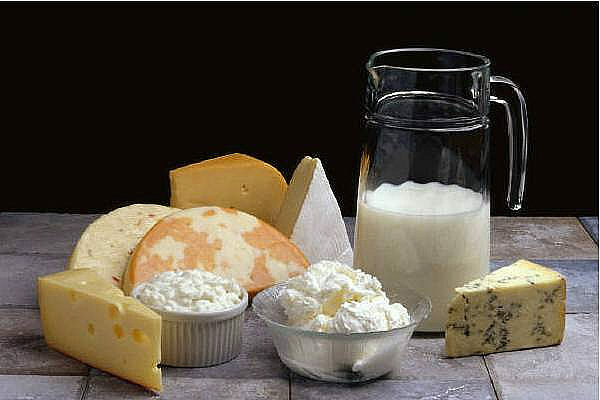 Thet many kinds of cheese in the world are a tribute to the inventiveness of cheesemakers. Charles de Gaulle is reported to have once said 'How can you govern a country that has 246 kinds of cheese?' But whatever may have been the administrative skills of that old French soldier, he was right about one thing. There's no single way to categorize all the types of cheese that have resulted from the efforts of those culinary artists. They can be separated by length of aging, texture, basic source, fat content or any other way that proves useful. But there are some fairly common divisions, even so. Fresh cheeses are made with very little rennet, an enzyme used to curdle the milk. In these cases, the acid or acid-producing bacillus is the predominate ingredient that creates curds that form the basis of the cheese. Cottage cheese and Ricotta are familiar types, but Neufchâtel, goat's milk chèvre, and others are made as well. The type of milk used may serve as a useful starting point. Much commercial, mass-produced cheese is made from cow's milk, of course. Not a bad cheese, but like anything mass produced the uniformity and familiarity make it something less than special. There are much more exotic types, however. Goat's milk or sheep's milk have been used for thousands of years as the base and they make some fine cheeses. Feta is still a favorite of millions. But the truly adventurous may want to try a mozzarella made from buffalo milk or a fine cheese from the milk of a yak or reindeer. Variety is the spice of life. Taste is unquestionably an individual affair. Some will rave over the flavor of a Limburger, while others won't touch Brie. But no matter your preference in type of cheese, there are certain factors that always should be taken into account. First, prepare your senses to make a good judgment. Before smelling or sampling a cheese, try to optimize conditions. Make sure your tongue and nose are ready. How? Avoid smoking for at least an hour before testing. Be a little hungry, but not excessively. Avoid heavy meals before choosing a cheese. Of course, your nose and tongue should be at peak capacity, so avoid making judgments when you're ill.
Second, avoid distractions. No, not the sort caused by noisy traffic, cell phone calls or children running through the store. More subtle ones. Don't use hair spray or strong cologne shortly before picking out a cheese. Avoid other odors such as those from onions, chili or other foods with pungent aromas. Third, isolate the cheese. Don't try to smell or taste an extra sharp cheddar right next to an Emmentaler. Cheeses absorb odors from anything nearby. A fine cheese shop will help you by keeping strong cheeses separate and well wrapped. Shop accordingly. Fourth, don't judge all cheeses by the exact same criteria. Certain basic factors should be common. But each cheese type has a distinctive flavor profile, texture and consistency and so on. A semi-soft Muenster won't behave the same as a semi-hard Feta. In fact, use the individual characteristics as criteria. Each cheese should follow its own standards. A Brie that has become crumbly, quite unlike its gooey nature when young, is signaling deviation from perfection. A Parmesan that is soft has been altered by external conditions, and generally in a way not to its advantage. As for general criteria, some are obvious. Every cheese considered should be fresh, in the ordinary sense. 'Fresh' cheese is a category and is one that is aged for a short time and intended to be eaten shortly afterwards. Ricotta is a good example. But even a 12 month old cheddar should not have hard spots or certain molds. In that sense, even a year-old cheese should be fresh. Some mold, for example in blue-veined cheeses such as a Stilton or Gorgonzola, is deliberately introduced. That's what gives those cheeses their particular identity. In such cases, the veining is the result of the introduction of a certain species of penicillum spore. But others represent simple spoilage. Other type-specific qualities apply. A Brie should be moist, while you should expect an Italian Grana to be brittle and hard. If the characteristics have been reversed, you know something has affected the cheese in a negative way. Let your nose and tongue be your guide. After all, the most important criteria of all in judging a cheese is whether you enjoy it! Softer cheeses are still enjoyed the world over, and fads change. Gouda and Roquefort would have at one time been considered the leading edge. They are still deserving of a place on the plate of any cheese gourmet. For something a little less well known, try an Edam or Kasseri. For the softest, on those occasions when that's called for, go for the Camembert. But don't miss out on a Manouri or Myzithra, or even a Telemea. Age is no longer as clear cut a category as might have been the case in the past. At one time, extra sharp cheddar would always have been naturally aged at least two years. But with the techniques of advanced chemistry, it's possible to alter the natural rate at which cheese ages. Still, some will still be allowed to ripen for as long as seven years. If you find one of those, you are truly a connoisseur. Whether your tastes run to a fine cheddar only a few months old, or a Cornish Yarg that may have sat on the shelf for years, only your taste can decide whether aging is a good thing or bad. The softness or hardness of cheese is a valid criterion, and it isn't always just a matter of fresh versus aged. Parmesan cheese is a common hard type, but still very tasty. Graviera is a less well known, but still excellent choice. Cheddar may be common, but still a favorite among many, and for good reason. Emmental, a traditional product of Switzerland, should be on anyone's menu. Cheeses take the characteristics of the country they were produced. Not as popular or well known as wines, but you could travel around the world and label every country by its cheese. Some people cannot tolerate well some of the ingredients in cheese. Others look for an alternative with less fat with all the beefits of real cheese. It is possible to obtain these benefits with cheese substitutes.